PULSES were racing at South Warrandyte Cricket Club over Australia Day weekend as the 1stand 2nd XI sat in 4th, just two points clear of 5th place. The club has been buoyed in recent weeks by the return of favourite son and Western Bulldogs Premiership player Shane Biggs. The last time Biggs played for South Warrandyte was the 2010/11 season. Biggs helped the 2nd XI in two tight chases in the games leading up to the Christmas break with not-out innings in both. In addition to Biggs, the club has also seen the return of Scott Brasher to the 2nd XI. Brasher last played in for the 6th XI in the 2016/17 season where he helped the South Warrandyte reach the Grand Final in the K Grade. Former club Junior and Fitzroy-Doncaster player Mitch Chappie debuts for the 1st XI in their Round 12 match against 7th place St Andrews who have won only one of their six games going into Australia Day weekend. Their up down season has continued, with the team unable to maintain its strong form going into the break. A win against North Ringwood was offset by heavy defeats to Croydon North and Scoresby. Tom Peter-Budge and Josh Barrett have continued their strong form with the bat however, and along with Josh Exley, will be key to club for the rest of the season. The 2ndXI four-game winning-streak came to an end in Round 11, losing by only 10 runs in a tight run-chase against Warranwood. Despite the loss, there was excitement in the stands when 14-year-old Lucas “Big Dog” Bridger made 38. In the games leading up to the Australia Day weekend, Lucas has taken 12 wickets and made 84 runs. The club is looking forward to watching this up-and-coming youngster progress over the months and years ahead. Sitting on no wins and with a bye for Australia Day weekend, the 3rd XI can only hope for a win in the final game of the home and away season where they will face 4th place Boronia on February 23. Despite their run of bad luck, 60-year-old Lachie McMahon is having a career-high year, accumulating 183 runs with an average of 36. The club also continues to watch the development of 3rd XI youngsters Rhonan Appleby and Kyan Brasher. THE 2019 MENZIES Community Australia Day Awards were held on January 26 at the Manningham Function Centre. 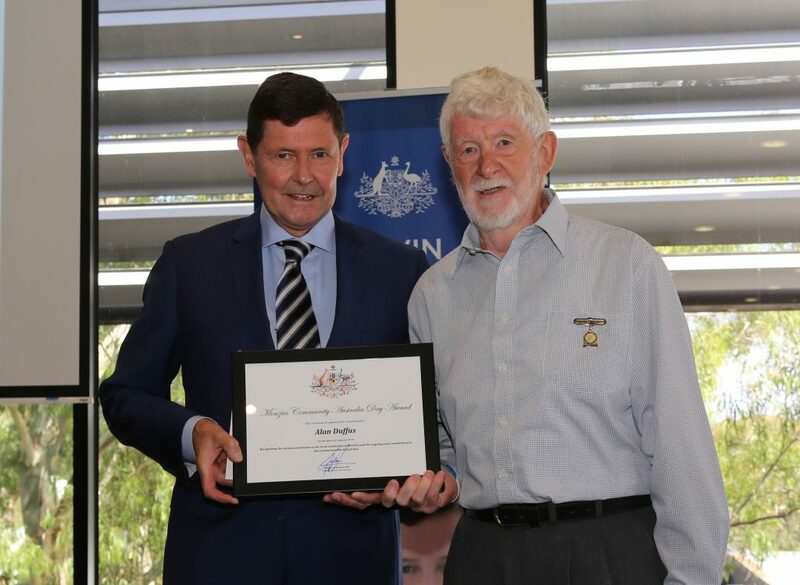 Presented by Federal Member for Menzies, Kevin Andrews, the awards are bestowed on those members of the community who make the country a better place to live. “Today we honour a group of individuals who come in many different guises, in many stages of life in a variety of activities that have all sought to contribute to our community. “We acknowledge them, we encourage them, and we thank them. “We recognise it is not government, it is not grand plans, but the commitment and dedication of individuals and families that ultimately build a great nation. “Alan Duffus has always loved sport from a young age, especially cricket and is known as a stalwart of the South Warrandyte Cricket Club. After retiring from the game in his mid-twenties, Alan resumed playing veterans cricket in 1990 and, at the age of 77, he has played one match in the Over 40s and one in the Over 60s this season. He has played well in excess of 200 veterans games, notwithstanding the number of senior games he played for the South Warrandyte Cricket Club. He has used his knowledge and skills in the game by being active in coaching and giving assistance to Captains in junior cricket. A Grand Final in Division 2 for South Warrandyte in 1994 was a special thrill for Alan. He has been an administrative coordinator for 25 years and served in the Ringwood and District Cricket Association committee for many years. He always says he was a decade late as he started playing Over 40s as a 52 year-old, Over 50s when he was over 60, the only time he has played veterans cricket in his own age group was at 65 when he played in the over 60s. Alan says he feels over-awed by the award. “I was always one to help children, when I had learnt a sport, I could pass that on, and you don’t see this [receiving an award] as something that will happen,” he said. Alan told the Diary he joined South Warrandyte Cricket Club to start up a veterans’ team in 1993/94. He was treasurer for 12 years in total, with the last couple of years mentoring a protégé. “A young fellow who was doing his accounting course and put his hand up for doing the treasurers job, so I looked after him for two years,” he said. And he has also been a mentor on the field. “I really enjoyed coaching juniors, including my grandson, he started in the under 12s and went through. “That was really beneficial because you see young children start at one stage and now they are playing in the Seniors, in the 1s,” he said. Before retirement, Alan worked at the Australian Dairy Corporation as an accountant. “They did a test and came to the conclusion that I was more an educator than a figures man, so teaching falls very easily,” he said. Alan has recently taken up lawn bowls and carried the same ethos with him to that sport. “I bowled with a young lass last season who was 13 years old, and I was bowling against her and I noticed a fault in her backhand and I pointed it out straight away — I was sorry I did because she beat me!” he said. “I have always felt that you can benefit a group by using your qualifications, and so I have done several treasurer stints,” he said. Alan loves sport and says that it is not just the physical aspect of sport that keeps you young.